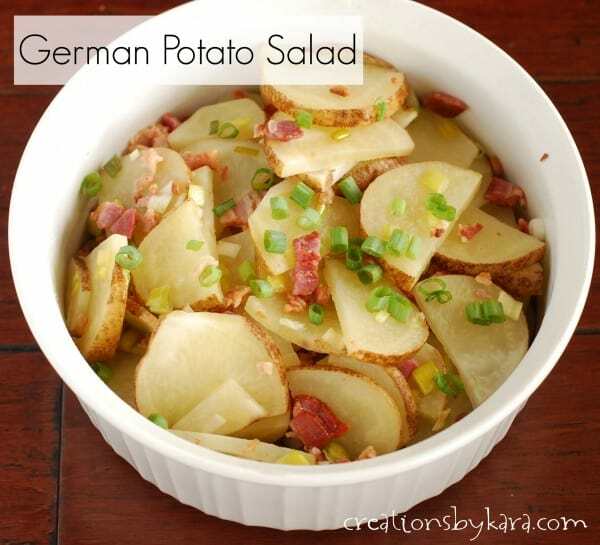 This German potato salad is unlike any other potato salad I’ve ever tried. I actually got the recipe from my younger brother Aaron. He made it in a high school cooking class and then brought the recipe home and made it for our family. I took the recipe to college with me and have been making it ever since. I love the tangy sweet flavor combined with the salty bacon. My family is content to have it as a main dish, but you could also serve it with any type of meat. Fry bacon till crisp; drain. Mix vinegar, sugar, water, salt, and pepper. Pour mixture over potatoes with bacon and onions. Cook in a covered glass dish in the microwave for 20-30 minutes, stirring occasionally, till potatoes are tender but not mushy. -The thinner you slice the potatoes, the faster it will cook.